View Berlin Wall and over 3,000,000 other topics on Qwiki. Erich Honecker, the East German leader in 1989, opposed protests that were happening at the Berlin Wall. He wanted to shoot all the protesters, but he was overruled and replaced by Eron Krenz. The people wanted the wall to come down, so they started tearing chunks out of it before the government could officially take it down. 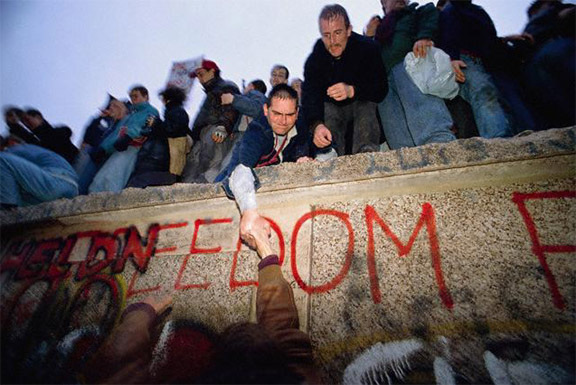 On Nov. 9th, 1989, the Berlin Wall came down completely and free elections were held. Germany was reunified on Oct. 30th, 1990, and the satellite states began to follow suit and get rid of the installed puppet leaders and the influence of communism.